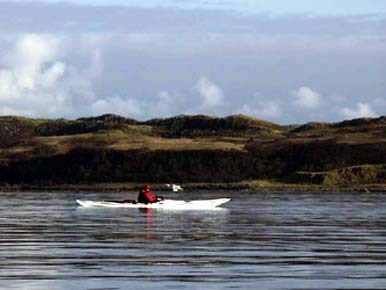 Shuna is approximately 3 miles long, and one and a half miles wide, covering an area of over 1000 acres. 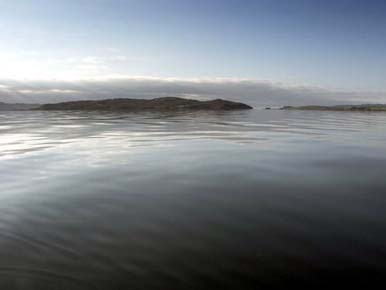 The island is 20 miles south of Oban, between the mainland and its larger neighbour of Luing. About three miles long and less than two broad, it presents a surface of less fertility and verdure than the neighbouring isles, but beautifully variegated with copses of natural wood. Numerous rivulets course down its brown sides, the position of each being indicated by meandering lines of birch and hazel which thickly clothe the depressions; while here and there on the less fertile areas of soil, clumps of the same species of tree dot the landscape. The whole, arranged with Nature's careless freedom and grace, presents the appearance of ornamental policies--only, as has been said, "man never did anything half so well." The island, once the property of the Lords of Lorn, was granted along with other lands in 1321 by King Robert the Bruce to Dugald Campbell, Knight of Lochow, as a reward for faithful services. In 1679 Lord Neil Campbell of Ardmaddie, a son of the eighth Earl of Argyll, granted a charter of the lands to a family of the name of MacLean, probably cadets of Duart, who owned the island until about 1815. It was then sold to Mr James Yates, a Glasgow merchant, who, in 1829, gifted Shuna to the Corporation of Glasgow, the revenue to be applied for the benefit of certain institutions and the poor of the city. However, Glasgow Corporation preferred the capital value and sold the island to a private purchaser. From a population which reached a peak of around 70 in the mid 19th Century there is now just one family left on Shuna. The relatives of the Island owner who are the sole permanent inhabitants amongst other things run a fish farm as well as letting out some of the estate cottages as holiday homes. ​None available to my knowledge with any great content about Shuna. This is not an island which seems to have merited much space in the history of our country. As ever please contact Lonely-Isles if you know of any books you think would be of interest and we'll add them to the site. Electric Scotland - Interesting site which includes the full text of a book called "Netherlorn and it's Neighbourhood". One of the chapters of the book contains a brief history of Shuna. Venture West - This company operates from Crinan Harbour in Argyll and runs regular leisure and wildlife cruises to many locations in the area including the famouse Corryvreckan Whirlpool.